There is a discussion, or maybe a debate, as to whether stenting as a treatment for choanal atresia is needed or if not stenting at all is an improvement. Those in favor on not stenting have an apparent admonishment of the treatment they find deplorable and cruel. Still there seems to be those who continue to accept the traditional treatment of stenting as necessary in order to avoid ongoing surgeries in order to maintain patency. The common belief is that in both cases there remains the requirement for ongoing surgeries due to restenosis. Information gathered from parents who have contacted the Foundation suggest that in both cases there is a requirement for three to four surgeries over a three month average before patency is achieved. There is however a third alternative. 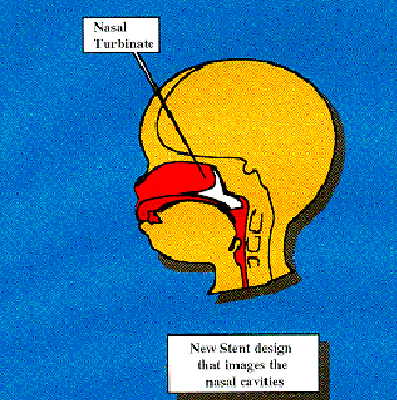 In 1988 a team of Boeing aerospace engineers and doctors from Seattle Children’s Hospital developed a nasal stent with specific requirements in mind. First and foremost was that the stent should allow the user to breathe normally without any struggling for a breath of air and by doing so improve recovery. Second was to eliminate the necessity for the dreaded home treatment of suctioning techniques so dreaded. The act of breathing and a moist Q-Tip would keep the nasal passage clear. Third was to eliminate the necessity for follow-on surgeries to insure patency, the stents would allow doctors to remove and replace them as necessary without the need for surgery or anesthesia while in they’re clinic. This is the stenting method presently used by doctors. It is an ad hock method that utilizes off the shelf materials that were never intended for the purpose being used. This method of stenting exacerbates the healing process by not allowing the nose to clear itself in a normal manner. The home care for this method is very frustrating for mothers who must suction the nose often to keep the airway clear, and breastfeeding is almost impossible. The stent causes families to become recluse because of the appearance of their child due to people who gawk, and the need to have a suction machine available at all times. "Stenting of the nasal airway, although necessary, may be a two-edged sword. The stent is a foreign body which causes granulation tissue and inflammation. It is also present to help prevent re-stenosis. The methods commonly used for stenting a choanal atresia repair are a modified endotracheal tube, movable stents designed to breaking adhesions or various types of hollow tubing. Stenting is achieved by using a 3.5-5.0 mm portex endotracheal tube, cut to a length that reaches into the nasopharynx. Stent material, shape, or diameter are of less importance than the surgical opening created plus careful mucosal flap coverage. The problem with the current stenting techniques are premature extrusion, dislodgement, lumen occlusion, formation of intranasal synechiae, excoriation or erosion of the nares, and the unsightly aspect of having a stent protruding from the nose." This is the new stent design that has been development. A team of doctors, engineers, and technicians worked together to design a stent that would mimic the interior shape of an infants nose. A casting was taken from a stillborn child and modeled into a stent. This stent allows the nose to function normally, requires less drastic care because it can be cleaned with a moist Q-tip, and a mother can breastfeed her child normally. The stent can be removed and reinserted in a doctor’s clinic without the need for general anesthesia. The stent is not visible to a passerby. "I'm sorry....I was just wondering if you had a standard "Info" that you sent people. After a very frustrating 6 months of not being able to breasted my baby and telling the doctor about her stuffy nose and being made to feel like I didn't know anything, I insisted we go to an ears, nose and throat specialist and we were just diagnosed with Choanal Atresia on the right side of My 7 month old Daughter. I want to make people around here aware of this?!!! I feel like I wish it was spotted earlier, It only took a few minutes that would have saved me so much worry, frustration seeing my baby "stuffy" all the time, feeling incompetent to breastfeed, I wish to try to help other people be aware of this. "My 4 year old daughter Claire who is one of a twin has just been diagnosed with coanal atresia and is to be operated on tomorrow. The condition was misdiagnosed since birth although I took her to several pediatricians and ENT's. I had been told all along that she had allergic rhinitis. As this seems to be a neonate condition which is normally sorted out just after birth I am obviously concerned that she is now 4 years old. Please advise if you have any knowledge of other children that have undergone this op at her age and if you forsee any problems because this has happened at such a late stage. "After 7 months of fighting with my pediatrician, my daughter was finally diagnosed with right sided coanal atresia. It was a frustrating battle each time I took her to the doctor to try to get a referral to find answers. The doctor thought I was just an over concerned parent each time I described her symptoms. Finally, at 7 months old, my daughter, Alysa, finally got to go to the ENT who sent her for a CT scan, which showed and stated everything I had been saying since she was born. I would like to know more of what to expect to come in the future and what she will be faced with in correcting the problem. The scan also showed signs of mastoiditis. If you have any information of where I can go to find out more of this, please let me know. These are typical letters, yet we received a letter from a mother who sat beside her daughter for 2 months holding her finger in her newborn child’s mouth so she could breathe. When her child was two months old, an intern suggested she had choanal atresia. She was operated on the very next day in treatment for bilateral choanal atresia. In 2004 a twenty-two year old patient arrived at a doctors office only to discover he had bilateral choanal atresia, the only known case of bilateral choanal atresia in which a patient survived to adulthood without treatment. In the vast majority of the cases in which a child was later diagnosed with choanal atresia, the subsequent diagnoses or treatment was given in other terms such as Rhinorrhoea or stenosis. This has only served to skew the statistics on choanal atresia. Without accurate data it would, and is unlikely, this birth defect will receive the attention it warrants. Is choanal atresia an uncommon birth defect everyone seems to think it is, or is there more to this than we really know? The only way to know for sure is to modify the Apgar Protocol to include a specific check of newborn infants’ nasal passage, at the time of birth, and see if the statistics hold true. How can it be that Arizona, which ranks 15th in population among the states has 40 incidents of choanal atresia while California, which ranks 1st has only 8 incidents? An analysis of the other states with regards to population and incidents of choanal atresia suggest the data is quite faulty. Recent data published by the CDC states that the incidents of choanal atresia in the U.S. is 17 per every 10,000 live births (approx 6,797per year). Yet the common belief by health experts puts the ratio at 8 per every 100,000 births; (approx 319 per year); which is correct? Information about choanal atresia is either highly inaccurate or nonexistent. Still there is no research or funding available for these children and families to accurately assess the real social impact. We do know that there are approximately 4,500-5,000 SIDS/SUIDS incidents each year. According to the data 66% of those deaths occur before the child is 27 days old, that critical 6-8 week period in which a newborn infant is unable to breathe through their mouth (approximately 3,300); Of those 20% (660) show signs of asphyxiation; they suffocated to death. We know that the vast majority of infants born with choanal atresia go undiagnosed for days, weeks or months. We also know that most cases of SIDS are not subjected to an autopsy unless there are indications of parental abuse, and that the person conducting the autopsy may not actually be a physician. If choanal atresia was not detected at birth it is unlikely it would be detected in death. Once again there is neither research nor data to suggest otherwise. "Thank you for the email. It is indeed possible that some cases of SIDS may indeed be cases of unrecognized choanal atresia. It is (un)likely that such an obstruction would be noticed at autopsy, but, as you know, some SIDS deaths are not followed by an autopsy. It is disconcerting that choanal atresia, on occasion, goes unrecognized; even if unilateral; a mild cold can result in near-total occlusion of the nasal passages. A portion of SIDS deaths we believe, result from an inability to restore blood pressure from a period of hypotension. That failure may result from damage/poor development of cerebellar-related structures. (The rationale for that statement is outlined in some of the papers that will be sent to you). One source of the "damage" may derive from an hypoxic episode as a consequence of obstructed breathing, and one source of such obstruction might be choanal atresia. (The relevant cerebellar structures are very sensitive to hypoxia, and are easily damaged). Thus, we are concerned about choanal atresia, not just from the perspective that the condition may directly lead to asphyxia, but also from the view that the condition may result in less-obviously apparent damage that later results in potential failure during sleep. I appreciate your pointing me to your web page. We are sending some relevant reprints this evening. Contributing to this concern is the fact that newborn infants are ‘obligant nose breathers’ and can require up to eight weeks to develop the ability to breathe through their mouth. Some medical experts believe it may take as long as twelve weeks for an infants to develop the ability to breathe through their mouth. The majority of SIDS deaths seem to occur during this same critical time in infant development. Please feel free to email us at contactCCAF@babynose.org for more information.